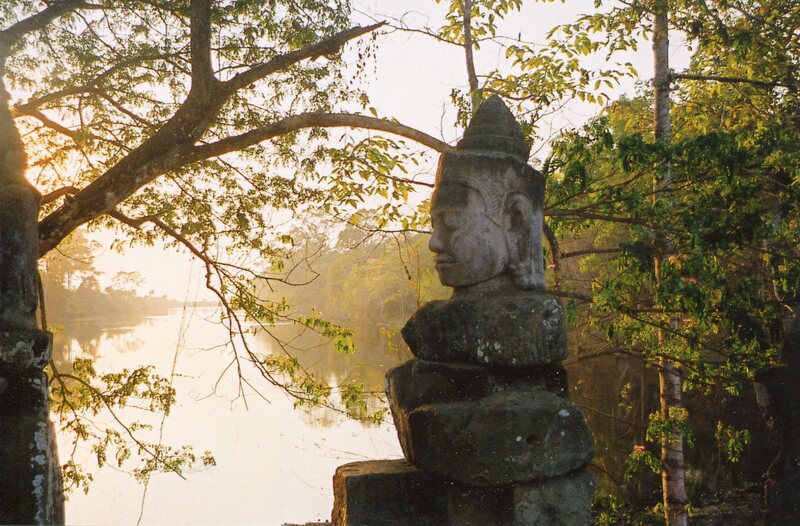 What a beautiful image of peace to see just before the south gate of the Khmer capital, Angkor Thom–a heck of a lot prettier than billboards on the LA freeways. But his counterpart on the other side of the road sure has a bad attitude. Both gave the Khmers in the 13th century a resounding message that they were entering a special place. 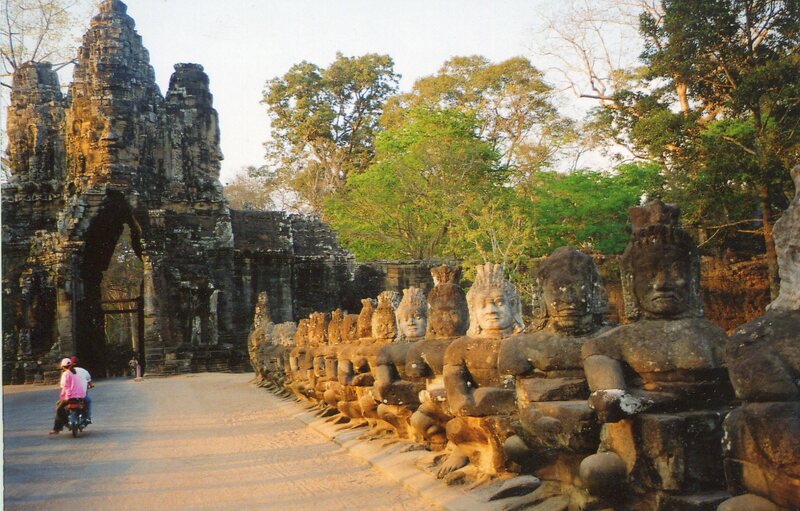 Angkor Thom was built about 50 years after Angkor Wat was finished. A lot of earth-shaking events happened in between, which historians still haven’t sorted out. Chams from Vietnam invaded, and they might have sacked Angkor. Several quick royal successions ensued, and contemporaries wrote that misery descended upon the land. Jayavarman VII then took the throne, and began a building program that would be the greatest in Khmer history, and in the pre-industrial world. The figures in the 2 pictures are on opposite sides of the road in front of the south gate of Angkor Thom–the royal city which Jayavarman built over the older capital. They have special meanings, which gave visitors an intro to the center of an empire that would have humbled its European contemporaries who were building Gothic cathedrals. 54 figures line each side. Those in one line are calm, and they represent gods. The ones in the other line are asuras (demons). Both groups are pulling a giant snake called a naga. An enormous scene of gods and asuras pulling a naga was carved on Angkor Wat’s east wall 50 years earlier. So Jayavarman was probably replicating an image of a key event in the universe’s history. In Hindu mythology, this tug-o-war churned the sea of milk at the beginning of creation. 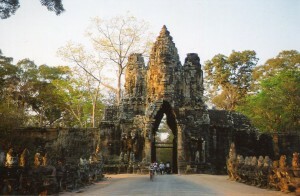 So the entrance to Angkor Thom was probably associated with a pivotal event in the ordering of the universe. And it wasn’t a mundane kind of order. Claude Jacques notes that many Khmer temples also have naga balustrades that line the approach, and that they might have linked our world to the world of the gods. George Coedes thought that naga bridges corresponded to a rainbow. If this road represented a rainbow bridge to the gods, it would have resonated with the annual rains that Khmer society depended on. The gate that the bridge leads to is equally stunning. Angkor Thom has 5 of them, and each has 4 giant laterite faces (one on each side) above the corbelled arch over the entrance. They smile a bit, without showing teeth. 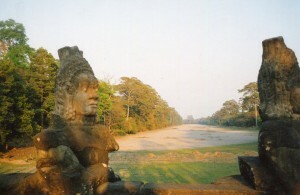 Some scholars have thought that they represent Jayavarman VII. Others have written that they embody Lokesvara, a Mahayana deity that represents the Buddha’s compassion–Jayavarman became a Mahayana Buddhist. Jayavarman might have fused his identity with Lokesvara in these towers. Other ideas about the faces have been proposed too, but if they did represent a Buddhist deity, the entrance to Angkor Thom combined Hindu and Buddhist ideas into a sensational introduction to the royal city. After the turmoil that followed Angkor Wat’s construction, Jayavarman VII might have been covering all bases to ensure people that that they were entering the political and spiritual center of the universe. The 108 snake-pulling figures correspond with the 108 towers of Phnom Bakheng, the royal cult temple of the builder of the older capital. So Jayavarman was using ideas that former kings established to order the empire, and mixing them with newer blends. And this is just at Angkor Thom’s entrance. Jayavarman’s fusions of ideas and images were as fascinating as Angkor Wat. 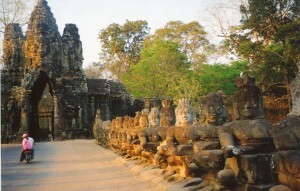 You can see some of the splendors within Angkor Thom at the Khmer royal palace, and more in a future post on the Bayon. Europe was also taking construction projects to new heights at the same time, at Chartres Cathedral.